21st Mortgage wants to help you understand the manufactured home loan financing process and help you determine the best options for you and your family. Here are some helpful tips and articles to guide you through the process. Will your income support all of your expenses and a monthly mortgage payment? 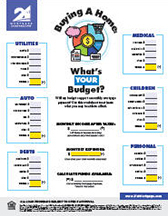 Use this worksheet to estimate what you may be able to afford. Are you ready to buy your new home? This helpful road map will help guide you through your home buying journey. Should I rent or should I buy? 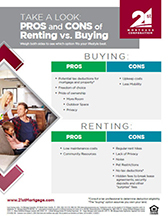 This article will outline some pros and cons for renting and buying homes. 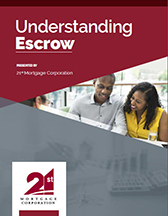 “Escrow” is the process where your mortgage company sets aside a portion of your loan payment for your annual property taxes and insurance. Learn the details and how it works. 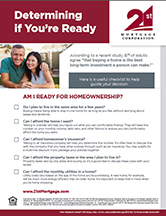 Are you ready to become a homeowner? Here’s a useful checklist to help guide your decision. Are you looking to get a new start on your finances? 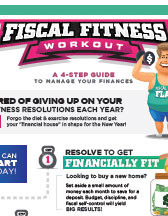 Here’s a 4-step guide to manage your finances and to get “Fiscally Fit” for the new year! 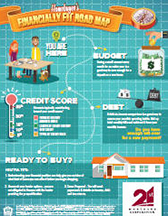 Your credit score plays an important role in the buying process. 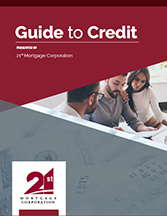 This article will help guide you through the credit process and provide tips for maximizing your score. The home buying journey can be a little complicated at times. 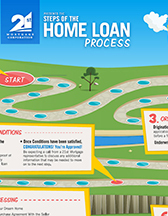 This graphic will help you understand the key steps in your home loan process.